After two to three years of dreaming, researching and preparing for this African adventure, things are finally happening! Our estimated departure date is 25-Sep-98. This has been a very busy year. 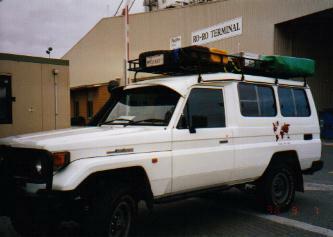 Early in Jan-98, we acquired Troopie, a 75 series white Toyota Landcruiser Troopcarrier at an auction in Alice Springs. Troopie was an ex-government vehicle, diesel, with 49000 km on the clock. She came equipped with a bull-bar, electric winch, standard 90 litre dual tanks, 2 overhead consoles and was in tip-top condition. 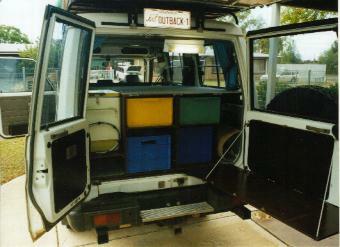 Convert Troopie from an 11 seater into a 6 seater. Install remote central locking, burglar alarm and anti-hijack system. Construct a hinged cargo barrier which folds down to the same level as the top of the shelves, thus creating a flat sleeping area. Install a 70-litre water tank under Troopie. 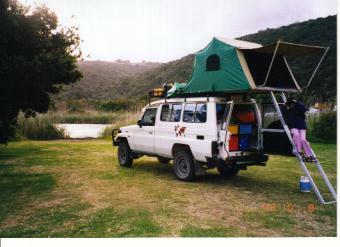 Install a full-length roof rack, modified to take on an Australian designed rooftop tent. The tent takes up the rear quarter of the roof rack, leaving ample room for a metal toolbox, second spare tyre and 2 jerry cans. 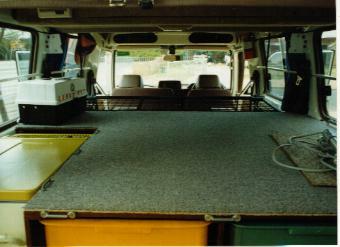 Design a shelving system for the rear cargo area. This is a 2 storey shelving which took plastic storage bins. The bins came in different colours so we devised a colour code for different things e.g. food, cooking utensils, clothes, tools, medicines etc… The shelving also incorporates a 39 litre Engel fridge and storage space for a two burner gas stove. On the inside of the back door, we made up a hinged fold -down table for preparing, cooking and serving meals. Changed the suspension on Troopie to a heavy-duty type. Bought 6 brand new tyres, a hi-lift jack and mount for the back door. A world map was put on the sides of Troopie so that we could dot our journey as we exit each country. Install a third heavy-duty battery to run our 39-litre Engel car fridge. Also ran power into the rooftop tent for fluorescent lighting and intercom. Make curtains for all the windows (matching blue of course). Prepared a tarpaulin sheet with hooks and clips for attaching to one side of the roof rack for the rainy days. Stocking up on assortment of spares for Troopie. All of this work was accomplished with the help and loan of tools from our friends, Ian Bragg and Stephen Ashley, both 4 wheel drive enthusiasts. Thanks guys for allowing us to raid your tool shed and for your advice! Now we are ready for the 2300 km drive from Alice Springs down to Melbourne. 21-Aug-98: Troopie was stationary on the driveway, all packed and ready to head off down the South Stuart Highway, bound for Melbourne. Kienny was shutting the gates when our neighbour backed into us. Our first accident! Fortunately for us Troopie had a bull-bar and we came away unscathed. Our neighbours were very apologetic and embarrassed. They came away with a rather large dent in the rear corner of the boot area. Anyhow, we said our good-byes and took off to collect Geoff who was waiting for us at the turnoff to work. Along the way we had two flat tyres within 50km’s of each other. We were surprised, as these were new tyres. Fortunately the tyres were fine and it was actually just the tubes, which were at fault. Our second night en-route to Melbourne was spent at Burra Gorge. Seemed a really lovely spot. There were other campers there all set up and settled in.... for a night of surprise! Not long after we went to bed the wind started to blow and blow and blow. The gale lasted all night. It was quite an experience for us in our roof-top tent. The car rocked and the tent flapped about endlessly. Other campers had to sleep in their cars as their tents collapsed one after another. We were also worried that our roof-top tent would collapse. Morning came. The gale force winds continued with unabated intensity. We awoke and were thrilled our roof-top tent had come through this tempest with flying colours. We climbed out and quickly folded up our tent and were on our way again in ten minutes, much to the amazement of all the tenters around us. We got to Melbourne in good time. Geoff flew back to Alice Springs while Kienny drove towards the eastern suburbs of Wantirna where her parents live. Whilst in Melbourne, Troopie got a grease and oil change. There were a few last minute things to buy and a final repack. We were notified that the ship to South Africa had been delayed yet again. As citizens of Australia we do not require visas for Southern Africa. In fact the only visa we needed to get in Australia was for Syria as this can be very difficult to obtain along the way. The big problem here was that this visa is normally only valid for three months and we needed six months. I spoke to the Embassy folks over the phone and they suggested we get a three-month visa in Australia and we should be able to extend this visa in Jordan. Kienny went to the Embassy and managed to see the Ambassador. Using her charm, good looks and wit (lies) she was able to secure a visa valid for seven months - a job well done. On Monday 7-Sep-98 Kienny and father left at 6:30am to take Troopie down to the RORO (Roll On Roll Off) terminal in Footscray. Her instructions were to take the car to the docks and hand over the keys - too easy to be true. They had no trouble finding the shipping terminal. However, when the word Customs and Carnet were mentioned, things became slightly complicated. After being sent to different docks in search of a customs officer they were finally told that they had to make an appointment with the customs office in the city. Kienny explained that Troopie had to be on the ship that very day. Customs then asked her to go to the city head office where an officer from the fifteenth floor came down to the inspect Troopie and finally endorsed the Carnet papers. Then it was back to the docks in Footscray. After leaving Troopie on the docks, the next step was how we go about paying. Again she had to head back to the city to provide shipping details for the Bill of Loading to be drawn up. Kienny then had to return three days later to settle the account. All in all it was a rather interesting morning’s work. In the next mail message we’ll let you know how we got on getting Troopie off the ship in Durban. Geoff finished work on Friday 11-Sep-98 and uneventfully drove our other Landcruiser to Melbourne - no accidents, no flat tyres and no windstorms. We are currently inspecting our investment in Mount Beauty, Dreamers Mountain accommodation, where you are all invited to stay for $165 a night with breakfast thrown in. As we were too stingy (and too poor) we stayed in the linen room. The good news is that just now as I am typing this message, a booking was just made for four parliamentarians - the bad news is that it's only for one night. Tomorrow Sunday 20-Sep-98, we drive to Sydney via the farm in Beckom. In Sydney we look forward to visiting some of our friends and our Africa consultants - Max and Shiela Newman who did the same overland trip through Africa last year. On Friday 25-Sep-98 we fly to Durban in South Africa where we hope to send you our next mail message.